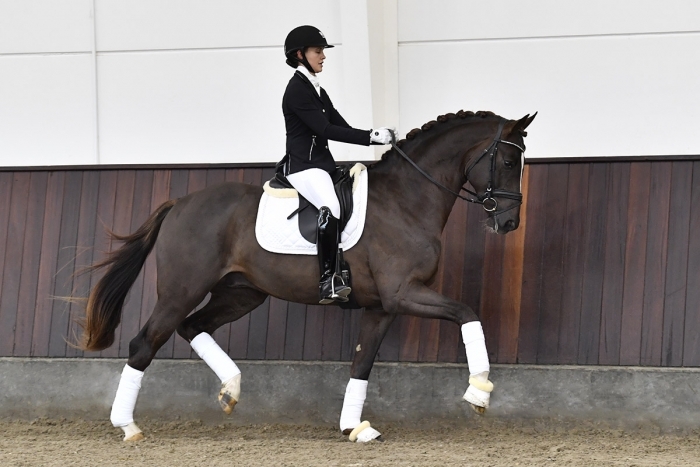 Diamancio is a modern and functional young stallion by the famous Diamond Hit, who won silver at the world championship for young horses in Verden as 5-year-old and won the German Bundeschampionship in Warendorf with Anja Engelbart in the saddle. As his sire, Don Schufro, Diamond Hit continued his successful career with several victories in international Grand Prix under Emma Hindle. The breeding legend, Don Schufro, won a team bronze medal at the Olympics in Hong Kong under Andreas Helgstrand together with Anne van Olst and Nathalie zu Sayn-Wittgenstein-Berleburg. Diamancio carries all these genes in his strong pedigree. The grand sire is the fantastic stallion, Florencio I, who had a successful career with two victories at the world championship for young horses as both 5- and 6-year-old under Hans Peter Minderhoud. He was later educated to Intermediare-level and has sired several successful sports horses, which managed to compete in a higher level than him. One of them is the well-known stallion Floriscount (Florencio I / Donnerhall), who is the sire to the Helgstrand stallion, Tophøjs Falchetto (Floriscount / Solos Landtinus). Diamancio is licensed in DWB, OLD, WESTPH, Süddt. Verbände, Mecklenburg, Rheinland. Diamancio is stationed at Helgstrand Dressage.